Ok, lots and lots of news to share today. ALL outstanding orders are shipped. Everything, in one shot. Boom, how you like me now? Everyone waiting on an order SHOULD have gotten tracking from shopify last night/this morning. If you didn’t make sure to check the same email address you used when you placed the order. If you still can’t find a tracking number, just ask me. I’ll give it to you. I have all of them here. So we’re ready for a new batch of orders. BUT before everyone stampedes to do that, a couple notes. I’ve upped the price on first class shipping by 2 dollars Why? Because insurance isn’t included in first class postage. What should be 2 bucks and change, comes out to four bucks and change once you add the insurance. Also, and I’m genuinely not kidding – packaging orders takes way, way more time than you imagine. I’ve also removed the TUBE option from our scrubs until fall. Why? Because temperature. Coconut oil will liquify at temperatures above 72 degrees and not only are the tubes useless if that happens, there’s a risk of leakage with the tubes, particularly in transit. It’s just not worth it. The tubs seal better and you can easily toss them in the fridge (the tubes are an awkward size for that.) There’s little point in sending tubes if all the scrub is just going to leak out of them so for the next several months at least, we’re going tub size only. Besides, you get a teeny spatula with the tubs. So now that all the balms are out, wow, I learned SO MUCH. They will only get more awesome in the future, However, part of that learning process has led me to raise the price on the balms a little bit (a dollar for the single sizes, 3 dollars for the multipack so you’re still saving half on the increase.) Why? Because the balms literally take 2x as much flavoring as the scrubs to get them to smell and taste right, and they contain 2 ingredients (in decent quantities) the scrubs don’t have at all (shea butter and beeswax, both of which we buy organic.) It’s not in any way a profit thing- it’s strictly overhead. So this initial batch was a test run. That said, now that I totally get what went right and wrong with this batch, they’ll absolutely be worth the extra dollar. Oh, I also renamed the balms with their own product name – Protecteur (it’s a song by Mephisto Walz.) . 5. We’re working on our new summer flavor, which will arrive in May, and also considering something for World Goth Day. We’ll keep everyone posted about that in the weeks to come. 6. A suggestion has been made that we make soaps. Though our plan was to work out our kickstarter for eyeshadows next, we’re not against doing soap if people want it. So tell us what you think. Would you like to see us make soap too? That’s it for now, gothywinkles. Thanks to everyone who was involved in our preorder, and please, go get some balms and scrubs! We really appreciate every order. I’ll be working out new promo images for our balms this week, too. 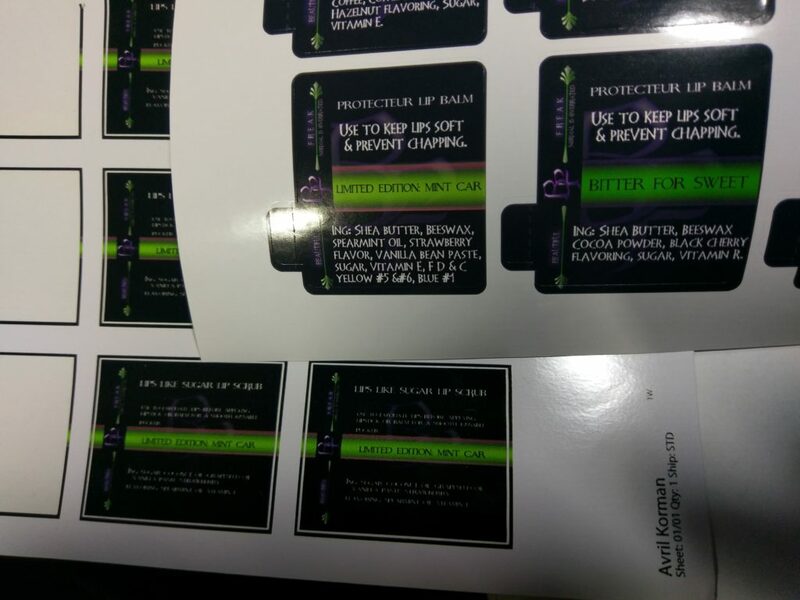 Previous Article: Lip Balms Ready to Go!